Okay, I'm back! After a rare two week hiatus, we have quite a bit of catching up to do! While preparing for the AAVSO fall meeting, and then away attending the meeting, I haven't had time to keep you all up to date on what is going on in the variable star and astronomy world that whirls around me each week. So we'll take a few steps back and then plow forward. October 31, AAVSO announced a special request for observations of 3C 66A, an active galaxy in Andromeda, while it is in its current highly active bright state. I planned to write a blog about this since it is one of my favorite variable objects, and at 2 billion light years, the furthest object I can actually see in my telescope. I hope to write about it this week, but there is a lot of new activity that may take priority over it. Also just at the end of October the fourth nova in Sagittarius for 2009 was discovered. It is now known as V5584 Sgr. 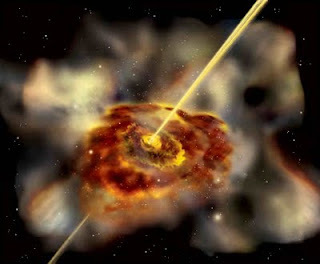 Just yesterday, a new possible nova was discovered in Scutum. Saturday, November 7, the Slacker Astronomy crew, Michael, Doug and I, aired an episode on 365 Days of Astronomy about the recent, extremely bright, bolide that exploded over Canada, very near our friend Doug's university! The AAVSO Cataclysmic Variable Section has begun a long-term observing campaign to monitor Z Cam type dwarf novae. I presented the first of what will be several research papers on this at the fall meeting November 7. I've also started a new web site devoted to Z Cams that I hope will become the authoritative reference on this topic in years to come. I'll be writing more about this exciting project in the weeks to come. This news has not been announced anywhere else except at the AAVSO meeting last weekend, so you readers are getting a scoop here. I interviewed Caroline Moore, the youngest person to discover a supernova, at the fall meeting. She is an incredible young lady. That will be airing as part of a Slacker Astronomy podcast soon. I received an advance copy of 'The Monthly Sky Guide' by Ian Ridpath and Wil Tirion, so there will be a book review coming soon. Something notable always seems to happen just around the holidays, a new nova, a rare CV outburst, or something else. What will it be this year? Stay tuned, and we'll find out together.